We’re proud to introduce our new “Farm to Bottle” Series of beers. Brewed to be enjoyed fresh, these bright and refreshing ales capture the essence of each season’s harvest. Inspired by the fruit markets of San Francisco’s Mission District, our Autumn 2011 Farmhouse Pale is an homage to indian summer in Northern California. By selecting the last organic plums of the season and blending in rich piloncillo—an unrefined brown sugar popular in Mexican desserts—we brewed a beer that celebrates both the Bay Area fall harvest and one of San Francisco’s most vibrant neighborhoods. Our first “Farm to Bottle” release is a Belgian-style farmhouse ale bursting with distinctive hop and yeast aromas. 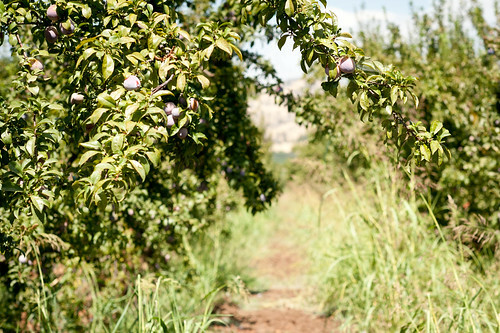 During the brew, we blended in the piloncillo and over one thousand pounds of ripe, organic California plums from the fertile orchards of Twin Girls Farm in the San Joaquin Valley. The plums add a subtle yet bright and fruity character to the beer. Next, we dosed the beer with generous helpings of Cascade and Amarillo hops. Added primarily at the end of the brewing process and then again after fermentation (dry hopping), these hop varietals give our beer it’s characteristic tangerine and grapefruit aromas. Twin Girls Farm is an all-organic, family run farm just south of Fresno, California. 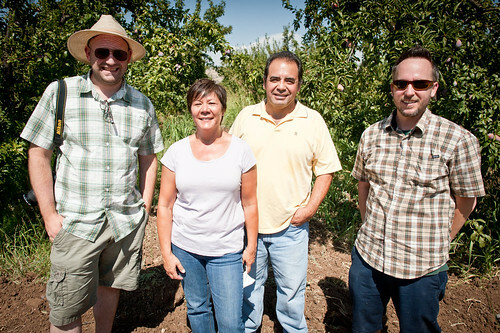 Owned and operated by the Sanchez family, Nacho and Cassi take great pride in their land and fruit, growing a huge variety of year round fruits. We visited in the last days of summer, just as the last plums and plots were coming off the trees and the first pomegranates were being harvested. You can read all about about our day on the farm here. Our Farmhouse Pale is bright, aromatic, gently acidic, and pairs well with a wide variety of cuisine. Try it with rich, flaky whitefish such as halibut or sea bass and finish with a wedge of lemon. Highlight the Belgian yeast character with a savory green salad with plum slices, toasted pecans and blue cheese. 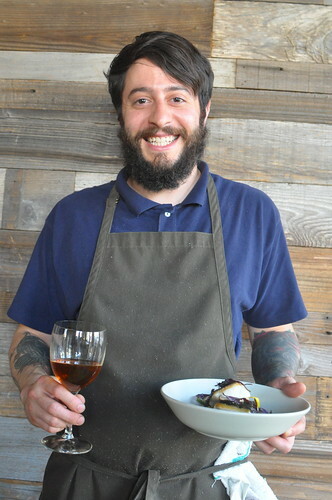 Chef Brett Cooper specializes in taking natural, bright flavors and letting them speak for themselves. When we introduced him to our Farmhouse Pale, he was immediately smitten with it. Thinking about the sweetness of the plums and the aromatic hops in the brew, he concocted a seemingly simple dish with great depth of flavors. It pulls out some of our favorite parts of the beer, highlighting the hop aromas and earthy farmhouse yeast. 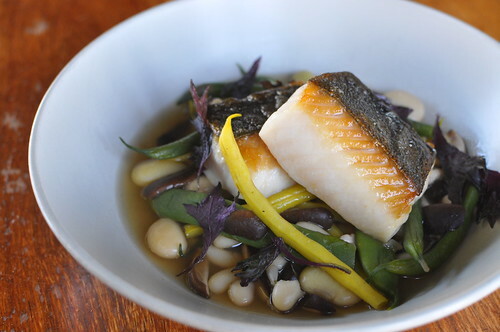 Brett started with fresh local black cod. Carefully seared on the skin side then finished in the oven, the fatty fish plays counterpoint to the hoppy aromas of the beer. In another pan he cooked a handful of seasonal beans, including Haricot Vert, Romano, Cannellini and Cranberry beans. 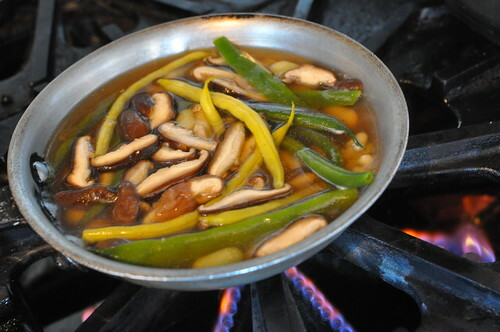 He added fresh shiitake mushrooms, and a stock made of mushrooms and Umeboshi – Cured and Pickled Japanese Plums. The cured plums added a slight sweetness to balance the earthiness of the mushrooms. The finished dish was topped with a touch of shiso leaf to pull out even more aromatics. You can find more pictures from cooking with Brett on our blog.